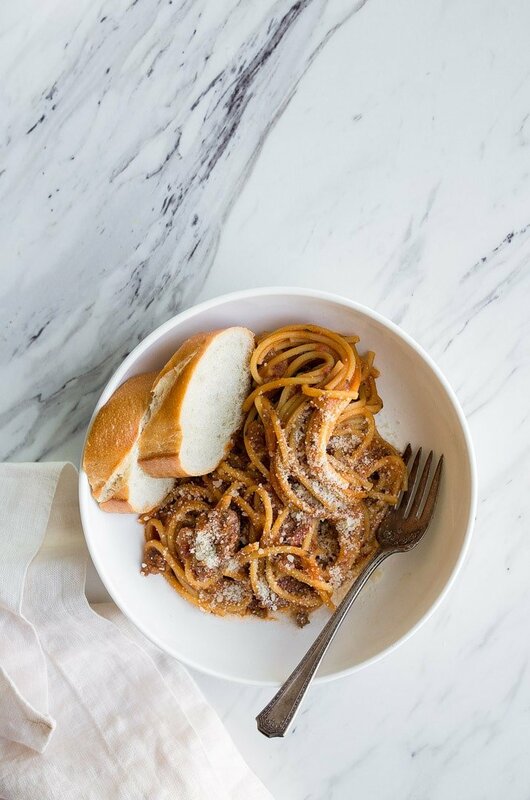 Instant Pot Spaghetti is my latest Instant Pot Mini recipe. I love this recipe because it comes together so quickly, but tastes like it was cooked all day long! I left town for 4 days, and came back to a brand new Instant Pot Mini on my mom’s kitchen counter. We normally discuss these kinds of purchases beforehand (and, we usually buy things like this together), but she just went out and bought one while I was gone. I was shocked! Like any new Instant Pot owner, she’s perusing the internet for Instant Pot recipes. She found a bunch she wants to make, but quickly realized they weren’t portioned for the Instant Pot Mini. It looks like I’m coming to the rescue! So, from now on, all of my Instant Pot Mini recipes will be requests from my Mom. It’s not a bad deal. She has excellent taste, so I think you’ll be happy, too. 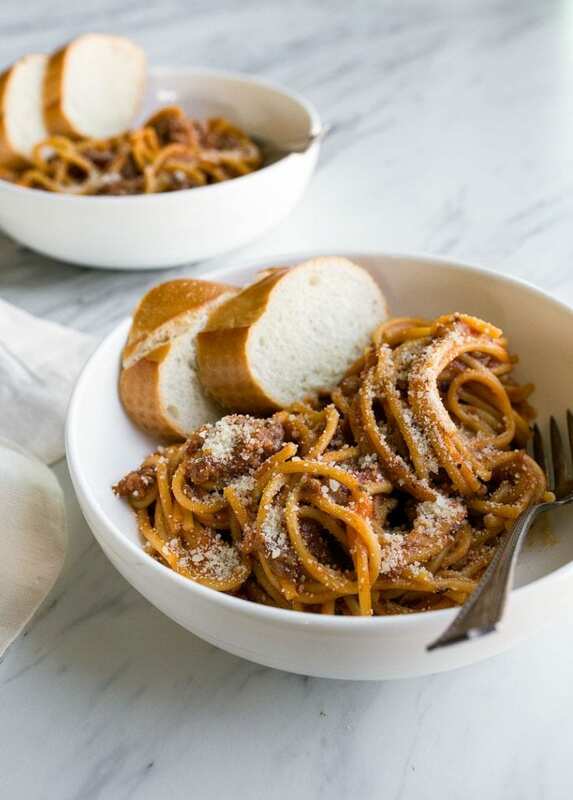 The first recipe to catch her eye was Instant Pot Spaghetti. I scaled it down for her to make in the Instant Pot Mini, and I think you’ll really love it, too! 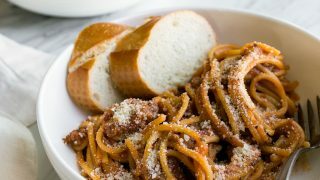 It uses just a half-pound of ground beef (turkey is great here, too), and fresh onion and tomato paste for a flavor boost. Be sure you push the noodles down so that they’re all covered by the liquid before cooking. Then, give it a good stir, awkward though, it is. The more I stir and separate the noodles before I pressure cook, the better my results. My last two batches didn’t have any stuck-together noodles. When it comes to liquid, I used chicken broth because I had some in the fridge, but water is just fine, too! 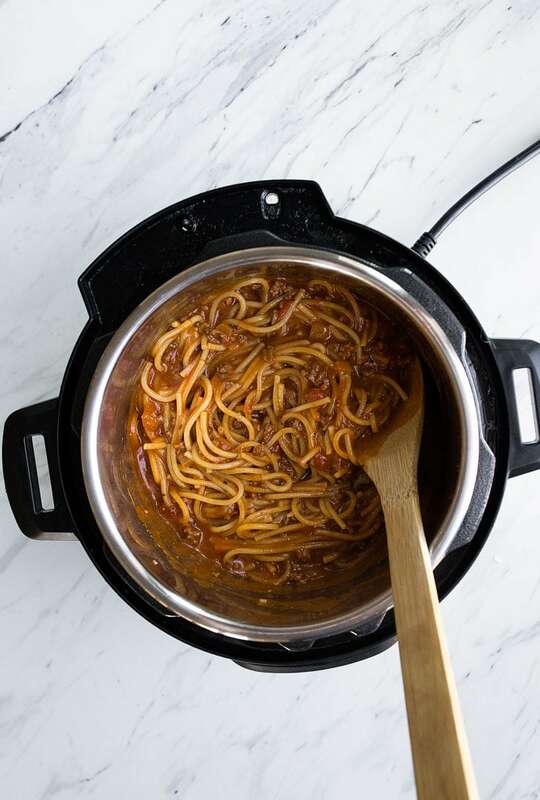 How many servings does this Instant Pot Spaghetti make? This recipe makes two very big bowls (more than what is pictured), so I would say about 3 average-sized bowls of pasta. It was the perfect amount for me, my husband, and our toddler to eat for dinner one night. Let’s say it’s a ‘generous serving for two,’ but still very clearly not enough for 4-6, like most recipes make. I’m always going to be your small-batch girl. 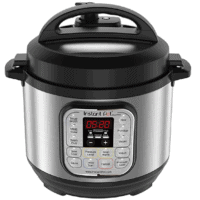 Can you just cut regular Instant Pot recipes in half for the Instant Pot Mini? It really depends; sometimes you can, but sometimes you can’t. A few people have done it successfully, but I have had issues with the cook times and liquid ratios. If you cut a recipe in half, I would also decrease the cooking time by about 20%. As for liquid, please be mindful of the ‘max fill’ line on the inside of the pot. If you accidentally end up with too much liquid after cooking, you can use the SAUTE function to boil off some liquid. It’s common to end up with too much liquid when adapting Instant Pot recipes, because liquid doesn’t evaporate from a pressure cooker like it can on the stove top. 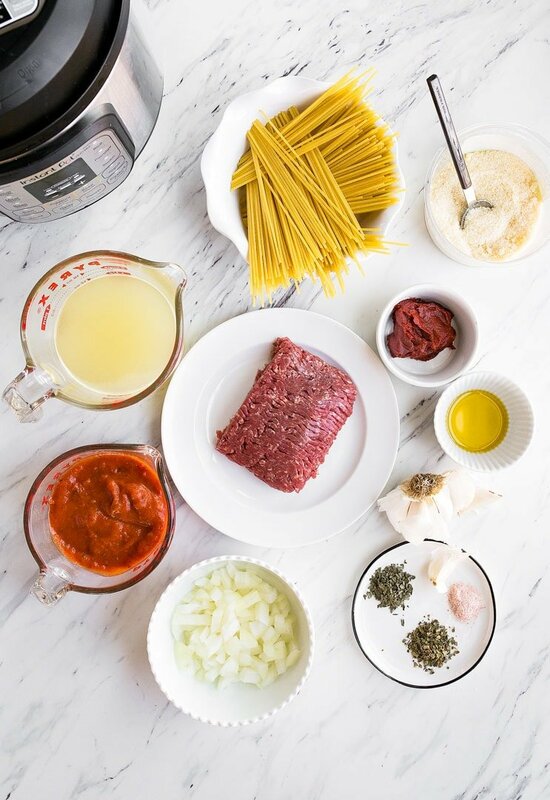 This instant pot spaghetti should only be doubled carefully. At worst case, you can drain excess liquid. Can you double my Instant Pot Mini recipes for your larger Instant Pot? This one is a clear YES. Several people doubled my Instant Pot Chicken and Dumplings to make in their 6-quart model, and said it worked great. I wish I could test all variations of a recipe for you guys, but honestly, I just cook for two. And, like, it would be weird to scale a recipe down for two, and then scale it back up. You know what I mean? I would be cooking in circles all day. Browse through the comments on any of my instant pot recipes, and you’ll see notes from people about doubling recipes. I love when you guys share this information in the comments section! 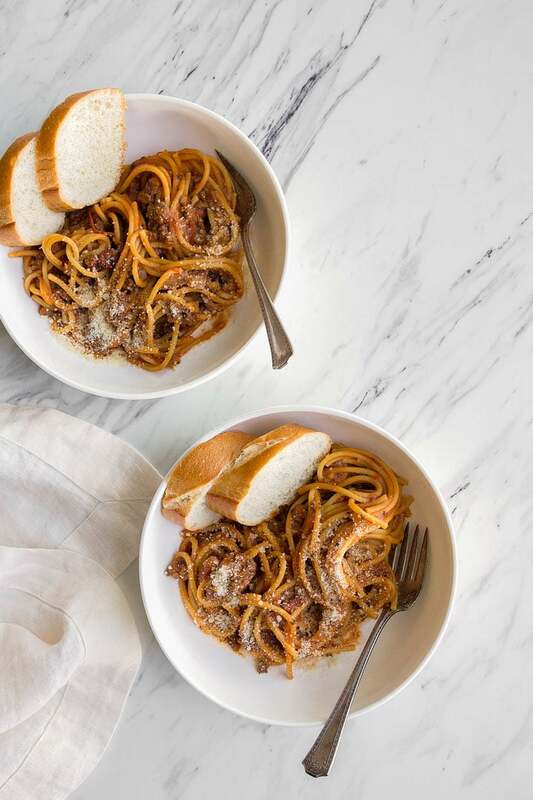 Instant Pot Spaghetti and Meat Sauce--made in the Instant Pot Mini 3-quart model. Press SAUTE on your Instant Pot Mini. Add the olive oil and ground beef to the Instant Pot. Cook for about 3 minutes, stirring and breaking up with a spoon occasionally. Next, add the chopped onion. Stir, and cook for about 4 minutes. Next, stir in the garlic, basil, oregano, salt, pepper, spaghetti sauce, tomato paste broth and Parmesan cheese. Stir very well. Break the noodles in half, and layer them in the tomato mixture, ensuring they are covered by the liquid. Press PRESSURE COOK and set the timer for 8 minutes. When the timer goes off, very carefully do a forced pressure release. Cover your hand with a kitchen towel, and gently release the steam. When you hear the float valve drop down, all of the pressure is released. Open the lid to the instant pot. It may look like there is a bit too much liquid, but just stir until it all comes together. If it's still too much liquid for you, press SAUTE and cook to reduce for 2 minutes. My family likes a lot of sauce on their pasta. Divide into bowl, and serve topped with more Parmesan. I just ordered an Instapot mini. It should arrive Sunday. This is going to be the first thing I make. Do the water test first and please read at least one instant pot blog. There is more to this than you know right now. Remember it is pressure cooking. There are some excellent groups on Facebook that are really fun, kind and helpful. Hey Julie, where from you bought your Instapot, I want to get one. Is getting from amazon okay? I got mine from amazon and so far it’s perfect. SO, SO happy that your Mom prompted this new venture ! The mini duo is an awesome gadget. As you say, the recipe hunt can be a real pain. Thanks for taking on the job of creating and amending recipes for the mini. I’m looking forward to your progress. Cheesecake is a real ego booster and fun to make in the mini ipot as well. This little pot provides yet another positive angle on creative cooking with ease. I was skeptical, but this is DELICIOUS and perfect for the mini instant pot! Thank you so much for the scaled down instant pot recipes! I have a 6 quart instant pot so I doubled this recipe, but I forgot to double the amount of pasta. So when I took the cover off I thought: wow, she is not kidding when she says her family likes a lot of sauce. A quick reread of the recipe brought me to the realization that I am an idiot, so next time I make this I will do it correctly and double everything including the pasta. Anyway, thanks for the great recipe. It’s delicious. awww Nancy! I’m glad you still enjoyed it :) Did you just boil extra pasta on the stove? I’ve had my Instant Pot for a month. Never used while trying to find recipes for the 3 quart pot. Will be trying the spaghetti as soon as possible. Hi, can you please specify the ratio between pasta and liquid (tomato sauce + water) if you want to do it vegetarian and cook without meat? Will the ratio stay the same? 6oz of pasta with 1 cup of sauce and 1+1/4 of water or do I need to put more pasta with the 2+ 1/4 cups of liquid? I just got my 3 qt instant pot and you were my first go to. Of course. My 5 year old Fallon is not a huge fan of spaghetti noodles. She likes either elbow macaroni or the corkscrew ones. Will this recipe work with that do you think? It should work fine with other noodles. I cook with elbow macaroni in my pressure cooker all the time. So pleased you have decided to bring us IP for Two recipes.. Thank you so much for the mini instant pot recipes. You are right, just cutting a recipe in half doesn’t work all that well. I have tried. Not with the best results may I add. Lots of recipes for the 6 qt size but not the Mini. So far I have made 3 of yours and they are great! Thank you so much!!!!! Keep them coming. Please! I usually cook my spaghetti with meat sauce on the stove for a good 6 to 8 hours. Would cooking this in the instant pot give me the same flavor? I’ve realized I’m out of sauce & it way too hot to cook. My family, now that they know I’m out of sauce wants spaghetti. OMG! This recipe came out soo good! I was hesitant on getting an instant pot, and then i saw it on sale and i had to get it. I haven’t had spaghetti in months and when you initially posted this on Instagram, I was craving it. It was a no brainer what my first recipe was going to be when it arrived. This recipe is so easy to make, minimal prep and I always have all of these ingredients on hand. Keep up the hard work on creating these InstantPot recipes! When you say to do a “forced pressure release” do you mean a quick release or a slow, controlled release with the knob held partly open? Quick release, sorry for the confusion! tasted fine, but still had too much pasta for the rest of the ingredients. Hi, Charlene. Thanks for writing. I’m glad you enjoyed the recipe, and I’m glad you were able to adapt it for your family’s taste. I made this last night and substituted pasta shells for spaghetti. I also threw in a touch of cayenne pepper. Absolutely delicious!! Lay 4-6 oz of speg. I buy hamb. In two # packages and cook with onion, freeze it in 1/4# packs, when it’s time to eat through in microwave then insta pot and go. Start to finish approx.25 min.